Crack the egg into a large mixing bowl and beat well with a fork. Add the meat, breaking it apart as you add it to the bowl Add in the rest of the ingredients EXCEPT the tomato sauce and the mozzarella cheese. Mix to combine everything well, using your fingertips. Don't compact the meat, and don't over mix it, you want these meatballs to be fluffy and light. Scoop out the meat into approximately 22 balls and roll the balls round with your hands. I used my 1 1/2 inch cookie scoop. Set the meatballs on a baking sheet and cook for 15 minutes. After you put the meatballs in the oven, pour the sauce into a 10 inch cast iron skillet and place in the oven along with the meatballs for the last 10 minutes of cooking, to heat up the sauce. 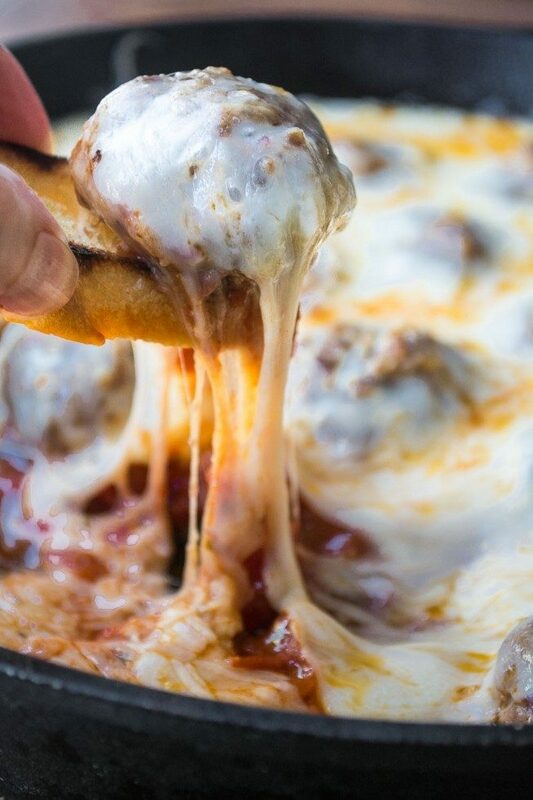 Remove both pans from the oven and transfer the meatballs to the skillet, nestling them into the sauce. Return the skillet to the oven and cook for another 10 minutes, If you made your meatballs smaller or larger, the cooking time may vary. Remove the skillet again and top with the cheese. Return to the oven to melt the cheese. Set under the broiler if you want it to brown, but watch carefully. Serve immediately with garlic toasts. To make the toasts, thinly slice a baguette and brush one side with olive oil. Set the toasts oil side down on a very hot grill pan for a few minutes until toasted. Rub the cut side of garlic along the toasted surface of the hot bread.